Some of you might wonder when I publish a Weekly Menu whether this is really what we have for dinner during the week in our family. Most of the time, it was not. The reason being that for me to keep publishing new recipes on this blog, I had to be ahead of the suggested Weekly Menu. Logique, non? Despite the needs for new recipes, I do try to keep a healthy balance for our family. So no, no matter how much my husband and children would have loved it, I never baked desserts everyday! 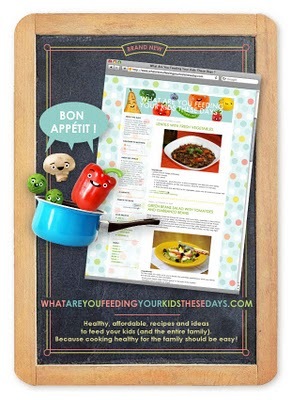 Unlike the other 15 Weekly Menus now available, this Menu is really what we ate this past week. You see, I started working again a few weeks ago... and I therefore realized something: I needed to be EVEN better with meal planning. Why? Because by the time I get home and only wished I could-relax/put my feet-up-with-a-cup-of tea-and-the-newspaper, reality hits me in the form of two lovely-but-hungry-and-tired creatures children: I have therefore 30 mns to prepare dinner if I want to avoid major meltdowns and still put my kids to bed early enough. 30mn Chrono! That's not much when you cook from scratch! So why did I do? I invested a few dollars into an iPhone app (I know I did not really need it but it does make my life easier and at this point, this is what matters!!) and started planning my meals a week in advance (inspiration generally comes on my way to/back from work). What works best for us is to have the next day dinner prepared the night before (Friday excepted) so that I have only minimum cooking to do to feed my children and I allow myself an Emergency dinner once a week. I stopped making my own yogurts for now but still make my own bread (starting the dough in the morning so that it's ready to bak in the evening). That way, we do manage to sit for 15 minutes on the sofa to enjoy some quality time while the main dish is slowly reheating on the stove. And while my children are eating their dinner, I start cooking the next meal : I am with them in the kitchen, we talk about life, we enjoy our time... So much better for all of us. And my husband in this story? Well, nothing has really changed for him... and that's not really fair, n'est-ce-pas? So yes, once a week, he'll be the one coming home early... and have a face-à-face with reality! Bonne Cuisine! Prepare the Lentils for Monday evening. I cooked the sausages directly with the lentils. You only have to reheat the lentils. I made more than I needed so that my children could take some to school for lunch on Tuesday. Make the Soupe de légumes for Tuesday evening. You have to cook the Couscous (5min!) and reheat the soupe. Since they had lentils and sausage for lunch, Tuesday dinner did not need to have animal proteins. For Wednesday dinner, I used frozen dumplings. I made the teacakes after dinner so that they were ready for Thursday. They don't take much to make so you could really make them in less than 30mns. I also made the Split peas soupe. I did not have anything to make beyond the baguettes. I made the Quiche Lorraine from scratch. It was more than 30minutes but because it's Friday it did not matter too much. We skipped the aperitif tonight because my husband could not come home early enough and we have friends coming over tomorrow evening. Since Meyer Lemons were on sale at the supermarket the other day, I decided to use some to make des madeleines. In France, madeleines come in all shapes (long, oval, round), quality (palm oil, pure butter) and flavors (chocolate, orange, "authentique" (whatever that means!! ), lemon). While children would eat them for their gouter, adults are more and more tempted to eat them with their after-lunch espresso... or with a cup of tea over the week-end... or with no special reason! I even know people who have them for breakfast instead of the traditional tartines de confitures! We grew up eating madeleines while we were with my grand-parents in Normandy. My grand-father was spending part of his summer near Semur-en-Auxois in Burgundy and every year, on his way back, he'd stop at the Biscuiterie du Mistral to stock on madeleines (and other butter cookies). I had not had madeleines for a while until this past summer when one of my cousins ordered cookies direct from the biscuiterie via internet! So yes, all of us, now adults, were savouring these little treasures while rememoring good old times! And children were starting to build their own memories! Proust did not make madeleines famous in France but did contribute to making them more popular overseas. I long for a good madeleine once in a while and I recently realized that I needed to bake them more often so that my children start to appreciate them more (seeing them loving those double-sided cream cookies makes me cry sigh...) This recipe for madeleines is more labor-intensive than others since you have to make a syrup first. However, they do taste great with Meyer lemons. I'll try other recipes out and will keep you posted. 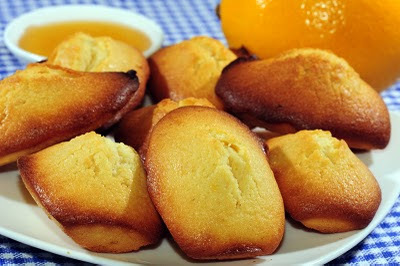 After the gougères, I'll make sure that you start baking good madeleines for your family! Bon Appétit! Cook the lemon juice and sugar over low-medium heat so that it turns into a syrup and reduces in volume. Gently stir in the dry ingredients into the wet until fully incorporated. Pour the melted butter and stir until smooth. Chill in the fridge for at least a couple of hours. The longer the better! Fill the molds about 2/3. Remove them from the oven when the edges are brown and the top springs back when touched. I like to make the syrup in the evening, then the dough in the morning to let it rest all day before baking. Alternatively, you could make the syrup in the morning, the dough in the afternoon and let it rest overnight in the fridge. 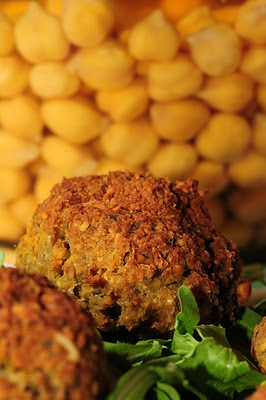 One of the first recipes I made from the book was falafels. 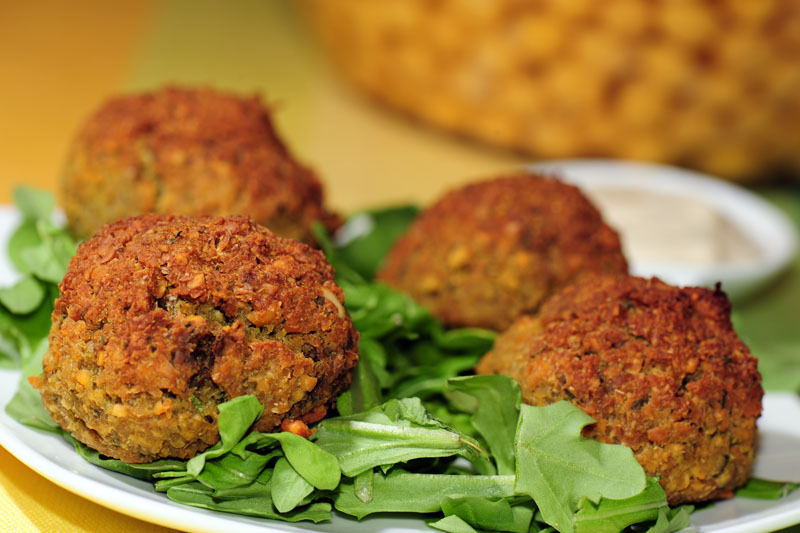 I love them but have been pretty disappointed by the ones I have had in restaurants or made with falafels mix. For the first time, I bought dry chickpeas, soaked them for 24h (and YES, they DO triple in volume!!)... and made falafels the next day. Except for the little planning it requires, the rest is very easy as long as you have a proper blinder (which I don't - next on my birthday list?). I baked them instead of frying them in oil. Purists might not like it but for the sake of my our waistline and our living room, I found the oven baking much better. 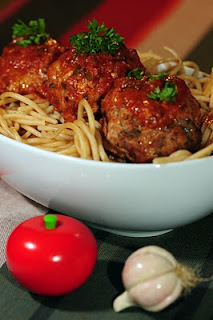 And even if they did not taste like meatballs whatsoever, my children ate them in no time! So please, next time you see dry chickpeas, don't pass them! Especially if you are tired of eating meat! Nothing wrong with cooking vegetarian meals now and then! Au contraire! Bon Appetit! Put beans in a large bowl and cover with water by 3 or 4 inches; they will triple in volume. Soak for 24 hours, adding water if needed to keep beans submerged. Drain beans well (reserve soaking water) and transfer to a food processor. Add remaining ingredients except oil; pulse until minced but not pureed, scraping sides of bowl down; add soaking water if necessary to allow machine to do its work, but no more than 1 or 2 tablespoons. Keep pulsing until mixture comes together. Taste, adding salt, pepper, cayenne or lemon juice to taste. Cook in the oven for about 40mns or until brown. You could fry them in neutral cooking oil at 350F for a few minutes. I added more parsley because I like it. Buffalo meat? De la viande de bison? Well, pourquoi pas, we do live in the United States afterall?! We tried buffalo meat because I am someone who likes to try new things. Even if it drives my husband crazy sometimes (mung beans? millet? kasha? ), I also find it healthy to step outside one's comfort zone. Since we wanted to find an alternative to beef, I came across grass-fed/no antibiotics buffalo meat one day and I bought it. Sans regret. For those of you who have never had buffalo, I find that it's drier than beef but despite its association with "wildness", the taste is not too powerful. I don't cook it often, maybe 3-4 times a year... and because of its dryness, I always try to mix it with "liquid". For example, it works great in the Moussaka if you can't find good ground lamb (or want something "lighter"). One of the big plus is that, according to the American Heart Association, buffalo meat supposedly has lower cholesterol level than beef, pork, or chicken even! Who knew? I did not until now. My children don't care at this point whether I serve them beef of buffalo. They just like their meatballs on their spaghetti! Which is nice because as long as the meatballs are shaped like balls, I can hide introduce anything in them and they'll eat them! And ask for some in their lunchbox for the next day! So, maybe meatballs with mung beans, next time? Bon Appetit! Stir in the egg-ricotta into the meat bowl and stirr well. If you feel that the texture is too soft to make meatballs, add a little bit more breadcrumbs. Make meatballs (about 2.5in in diameter) and place them on the baking dish. Make sure you leave enough room between them. Cook in the oven for 30mn, flipping them over after 20mn. Pour the remaining of the Tomato sauce, mix in with the liquid that came out of the meatballs. Cover with foil and place in the oven (350 F- 175C) for another 20-30 minutes. If you are used to making meatballs with pork&beef, you won't add as much breadcrumbs unless you poured too much tomato sauce. I don't make my own tomato sauce; I used already prepared one but tried to stay away from the Marinara/3 cheeses ones that tend to be too salty and less healthy. 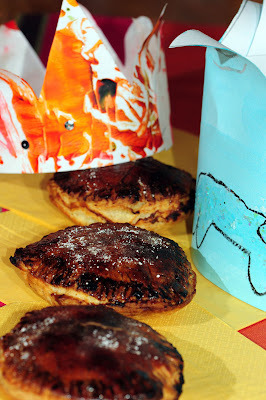 Epiphany was last Thursday (Jan 6th) and I had been asked (and volunteered) to make a galette des rois for my children to bring to school since every year, they have the traditional galette in every grade. In the Pre-K grades, one of the week activities is to make a couronne. Every child gets to wear his/hers after eating the galette, even if he/she did not get the fève! I saw a few confused parents after school on Thursday who did not really understand why their children were wearing a beautiful crown that day!! As I wrote last year, la galette des rois, is really one of my husband's pastry specialties... so I was assuming that he was going to make them (I had asked him before and he had agreed!) 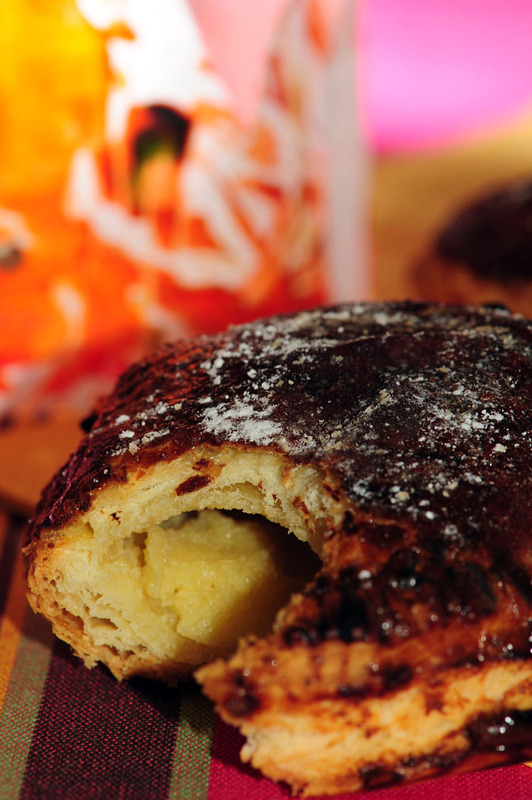 To make things simplier, we decided not to make the pastry puff ourselves but to purchase some frozen one instead. Here comes Wednesday late afternoon. I call my husband at work to get a better idea of when he is coming back, reminding him that he had to make two galettes des rois... only to hear that he has so much work that he won't be home until way-too-late to even think of making les galettes des rois! That meant only one thing: I had to make them!! Had I known that a few days before, I would have spread the work over two/three evenings, which would have made the whole process much more efficient. Since I only found out at the last minute, I made the whole filling and the galettes that evening. I froze them overnight and baked one early Thursday morning and the other one on Friday morning (for my daughter's class) before school. Making the filling is not difficult at all. It's just time-consuming because you have to wait for the custard (crème pâtissière) to be fully cold to mix it with the almond filling. At least, now I know and I'll be more prepared for the next galettes des rois to come! For once, and because my husband is too busy searching for money (before he can start searching for macula-degeneration cure), I think that we'll break the January-only tradition of the galette des rois and make some to share with our friends in February and March. Nothing wrong with me because, unlike people in France these days of the year, it's not like we are eating galettes des rois a few times a week in Philadelphia! Maybe we should? Bon Appetit!! - 1/2 vanilla bean, sliced open and scrapped. - 1 ts rhum or almond extract. In a bowl, stir the sugar and egg yolks together until light and fluffy. Pour the boiling milk onto the egg-sugar-corn starch and gently mix. Pour everything back into the saucepan and cook the crème for a few minutes, constantly stirring. As soon as it thickens, take it off the stove. Pour the crème pâtissière into a bowl. Cover with plastic wrap (the plastic should touch the cream so that no crust is formed). Chill overnight. Work the butter with a spatula, so that it becomes almost creamy. Add the almond flour, the powdered sugard and one egg at a time. You should have a smooth batter. Add the corn starch, rhum (or almond extract) and stir. Reserve in the fridge. Spread the pastry sheets over a lightly floured top. You want to make two circles of about 11 inches (28 cm) in diameter. With a brush, brush some egg white along the edge of the bottom circle. That would be the "glue" for the two sheets. Spread some of the filling onto the first circle, starting from the center of the circle and not going to the edges. INSERT THE FEVE/TINKET!! Put the top circle on top of the filling. Use a fork to seal the two circles and to make marks on the top of the galette (for decoration). Pre-heat oven to 465F (240 C). Open the oven door, dust a little bit of powdered sugar on top of the galette and bake for an extra 5 minutes. Because I did not wait long enough for the crème pâtissière to be really cold, my filling was on the liquid side. I had therefore too much. I used the extra puff pastry to make individual galettes. You could make the Crème d'amandes first and keep it in the fridge for up to 5 days. Freezing the galette is key. But don't get me wrong, French people take an easy way out too! First, we don't celebrate Thanksgiving and second, we don't go into the trouble of wishing people a Merry Christmas/Happy Hanukkah, at least not in writing. We just bundle our best wishes for la Nouvelle Année. And unless you are home with no kids, a lot of time to kill and a PhD in Philosophy or French literature to elaborate on the wishes, you generally wish people "meilleurs voeux de bonheur et de bonne santé" for Happiness and Good health! What I don't like about the cards is that I sometimes feel that people have me on their mailing list and therefore feel compelled to send me a card. Not that I mind but I'd rather get a short phone call, a postcard sent from their home/vacation town during the year, a text-message even... Since we don't live in France anymore and since we moved to the digital age very fast, and since it's only January 3rd, I have yet to send something out (a video?). However, more than sending anonymous obligatory cards, I have jumped on the other American tradition to send/give food as presents. And that, in a way, seems a better way to celebrate the Holidays and the New Coming Year. My favorite gift this season has been a small jar of my homemade Granola (I even tried to send 2.3kg (more than 5 pounds) to France to share among our relatives, only to be stuck in my husband's suitcase in Frankfurt because of the snow (and still hoping to get it back!!)).... but I have also given fresh baguettes, chouquettes, gougères, in addition to three-course meals at our place. Sharing meals (or food) with family and people is important, including that lonely neighbor across the street. It's more important than having these people on your Season's Greetings mailing list. Seriously! 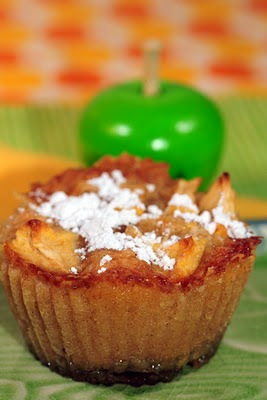 These petits Gâteaux aux Pommes would be a perfect way to start... Bon Appétit! In a bowl, mix in all the dry ingredients together. In another bowl, combine the egg, milk, cream and vegetable oil. Pour the liquids onto the dry ingredients and mix well. Pour the batter onto the molds about 2/3rd full. In another bowl, cream the butter and sugar together. Put the cakes in the oven for 10 minutes. 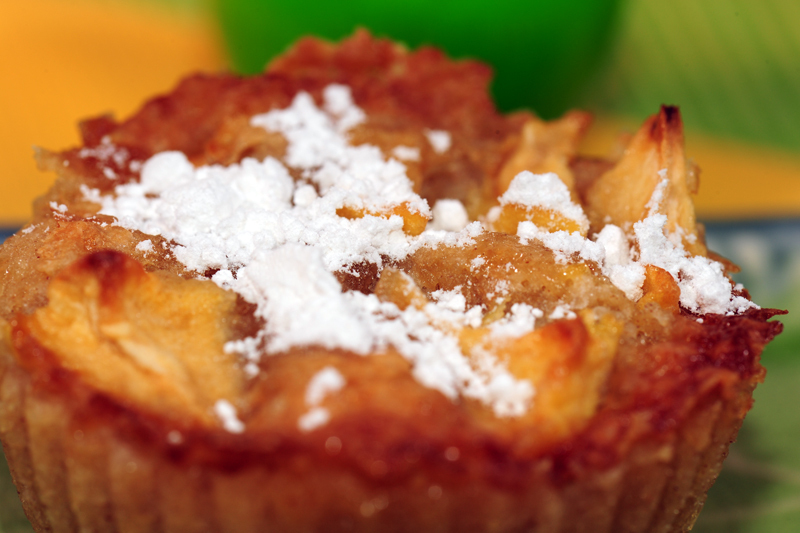 Dust with powdered sugar for decoration! Make sure you don't overcook the cakes in the first step (10minutes) because the cake needs to be soft enough to absorb the cream. You could make a large cake instead of smaller ones. Just add a little bit more time for the second baking.